-From Beautiful Willamette, (1868) by Samuel L. Simpson. When doomed Samuel L. Simpson, Oregon's first poet laureate, wrote Beautiful Willamette, he had a choice as to what form of name to address his muse. 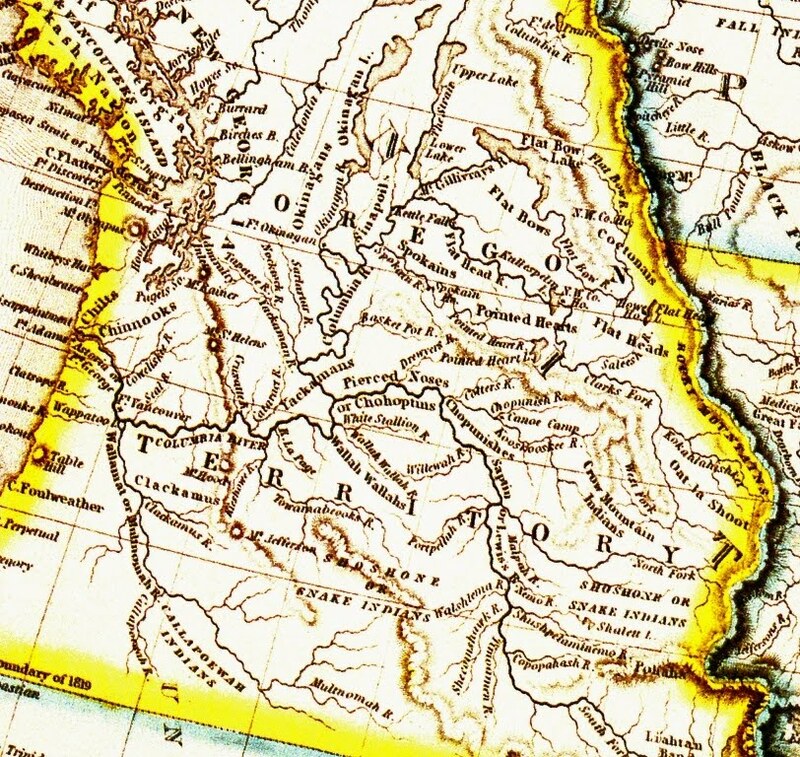 A dozen or so variants in spelling and pronunciation, dating from the exploration and early settlement eras, had winnowed down to two leading contenders: Willamette and Wallamet. In the decade that followed, a protracted public debate ensued, with supporters of each name arguing passionately for legitimacy- "The Wil / Wal Controversy." 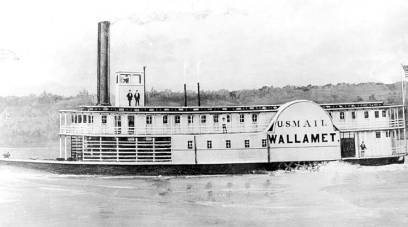 The steamboat Wallamet, circa 1854. "The orthography of our far-famed valley is curiously unsettled, like a good many other things in a newly settled country. The "University Press," the Statesman, Fremont, the first bound volume of Oregon laws, the pronunciation of the early settlers, following the natives, make it Wallamet. Wilkes, following the Frenchified of some romantic scribblers of the East, has it Willamette." The Statesman was the Salem newspaper, John Charles Fremont a western explorer, and Charles Wilkes was the leader of the first U.S. Navy expedition to the Pacific Coast. "We rather think the Wallamets will in the end have it." "Among the fir clad hills and broad rich valleys of Oregon, the bucolic instinct still lingers. Of the 100,000 people who constitute the permanent population of Oregon, fully four fifths of them dwell not in town or village, but upon farms. Yet the commercial metropolis of Oregon, Portland-on-Wallamet is the second town of importance on the Pacific Coast. Next to San Francisco the capital of commerce of the Pacific Slope will center in this solid and respectable Oregon town." -The Overland Monthly, July 1868. "The word is of Indian origin, and as they have no written language the early settlers of this country caught the pronunciation from them and gave it an English orthography." He noted that it was spelled differently by different people and listed three variants: Wallamet, Whalamet, and Wallamut. As for Willamette, he believed it derived from a mistaken belief the name had its origins with the French Canadian voyageurs employed by the the Hudson's Bay fur company. 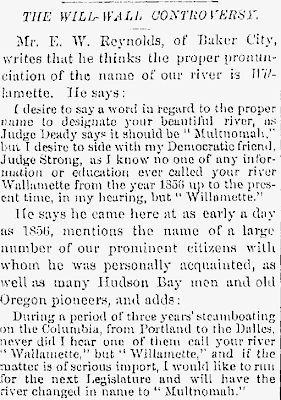 By the time of Deady's writings, Willamette was the more common name in use. 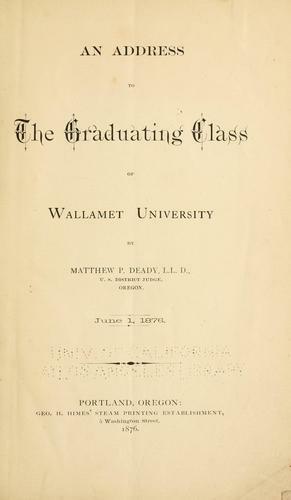 Evidence of its continued ascent could be found in Wallamet University changing the spelling of its name to Willamette University in 1870. "...there does not appear to be, even among educated persons, any uniformity as to the method of spelling the name of the valley, which is by far the richest and most interesting portion of our state." "It ought not be forgotten that this University was built up by the early missionaries, upon the foundation of an Indian mission school; and that the same missionaries procured for it a charter, designating it as Wallamet University- not the affected and fanciful French name of Willamette University. 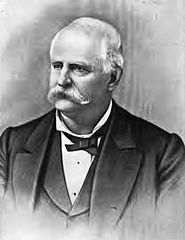 Thornton's letter was met with a rebuttal by William Strong, a fellow retired Territorial Supreme Court justice, who advocated for Willamette in the Daily Herald, March 13, 1870. Strong doubted the name had a Native American origin. If it did, he thought it unlikely used for the entire river. He cited the journals of the Lewis and Clark Expedition which referred to the river below the falls as the Multnomah. 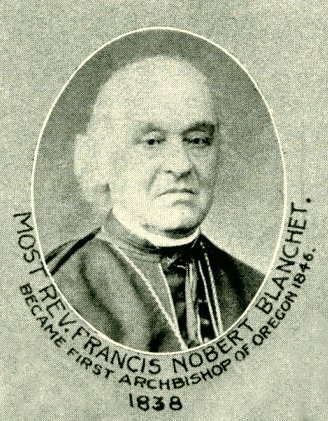 He believed the word had French roots, referencing a letter from George Simpson of the Hudson's Bay Company to the Bishop of Quebec in 1838. 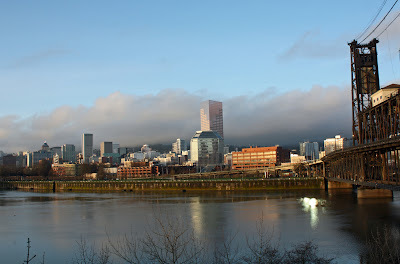 He also related a "charming legend" of three French boys named Guilliam (William), who once lived along the river; thus the Guillamette (little Guilliam's) River, anglicized to Willamette. 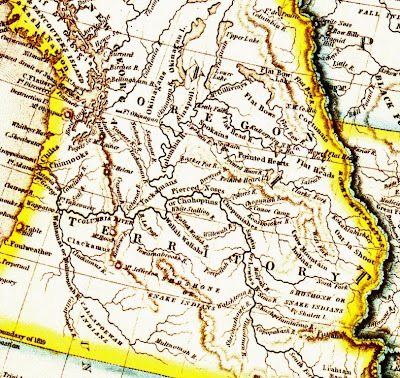 The Wallamat, or Multnomah River flows deep into the eastern reaches of the Oregon Country in this 1825 map. 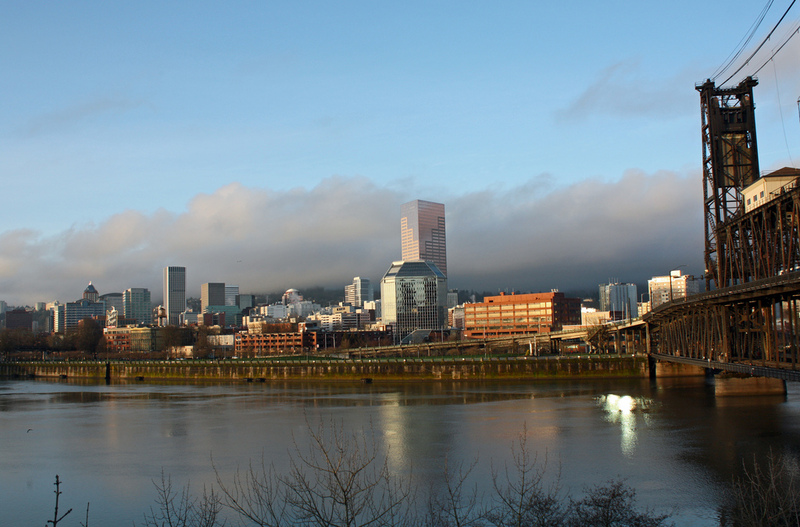 Multnomah is from the Chinook word for downriver: nematlnomaq. 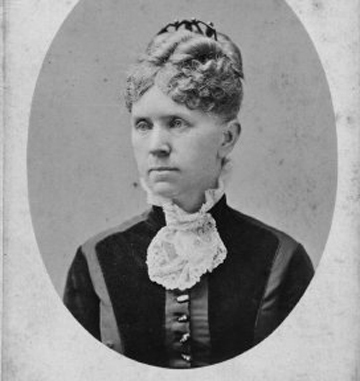 The Wil / Wal Controversy began in earnest with the publication of the State Code in September 1874 which adhered, as all prior ones had, to the Wallamet name. 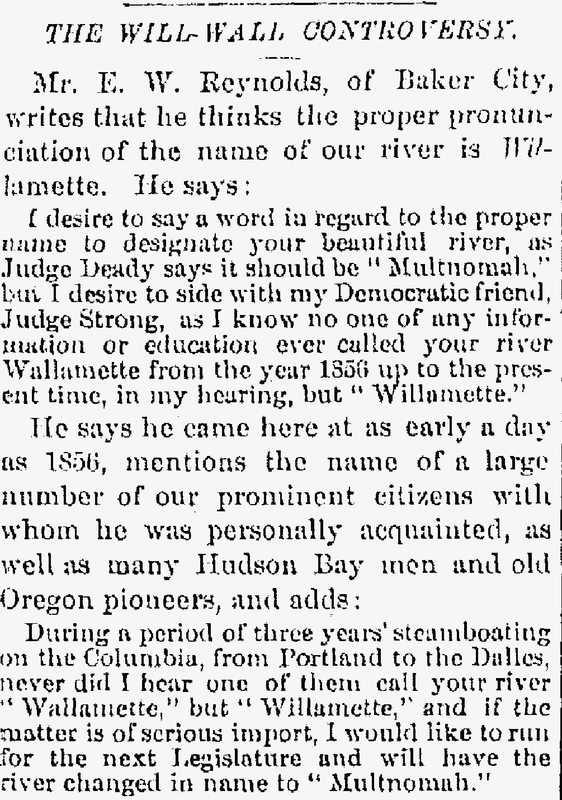 Complaints on its usage in the Oregon legislature prompted Judge Deady to write The True Name of Our Beautiful River in the Oregonian, October 15 1874. "The use of Wallamet can be traced back to the early part of this century when the country first became known to white people. It is an Indian word, and the true and original name of the river, while Willamette is an ignorant and anonymous fabrication or a modern corruption of the former." "...admitting that no one is bound by authority in this matter and that we are at liberty to adopt whatever name we may fancy, we should chose the old name by all means. As between it and the modern, spurious one, there is no comparison in point of strength, dignity or euphony. 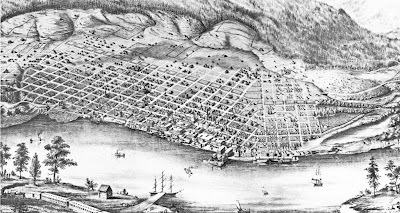 Willamette has a thin, close, meagre sound, and a petty, foppish appearance, while the broad, full sounding Wallamet is every way worthy of the incomparable and beautiful river shall yet be known as the paradise of the Pacific." Archbishop Francis Norbert Blanchet had written on the subject as "An Old Pioneer" in 1870. He returned to it under his own name and title in a letter to Governor L.F. Grover, published in the Oregonian, October 7 1874. 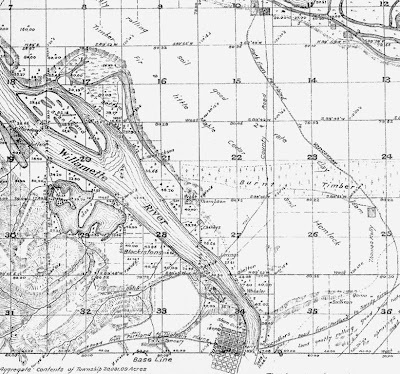 "Is there still any chance for restoring to our river, and its valley, this old and time honored name? If there be, please make use of the present to obtain it." 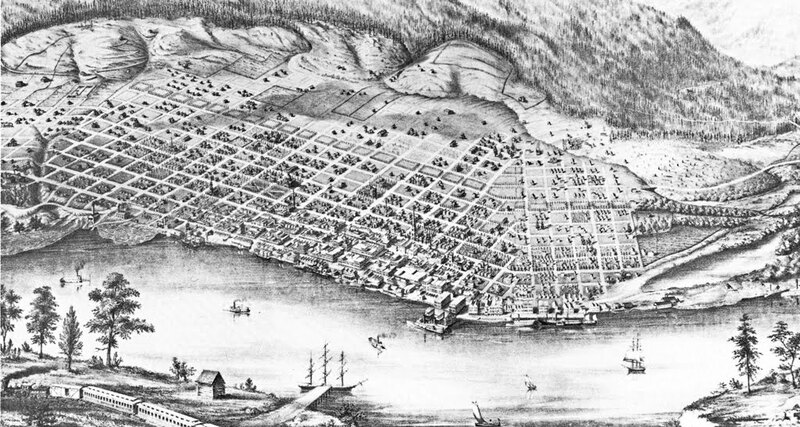 The Willamette River flows through Portland in 1852. "When a new code is prepared by the Judge (Deady), it produces a newspaper controversy upon this subject, which seems to establish the strong presumption that the name Wallamet is not and never will be accepted by the people. This may be the reason why he persists in his effort to change the name. He seems to have a mania for reform of a sensational character." "...about the time when we first began to have authentic accounts of the river from educated and intelligent persons; and if such a change did take place at the time it was the result of American settlement, and a change from barbarism to civilization." "The name is too well fixed in the public mind now to be changed, even it were objectionable in point of taste. But I contend that Willamette is as much better taste than Wallamet as Mississippi and Virginia are in better taste than Mass-a-sap and Varginny." First, that the Indians never gave names to rivers as a whole, but instead used descriptive words in speaking of certain localities; hence that, on this plan, every river had various names, according as it was rapid, or deep, or clear, or stained, or had a fertile or barren shore etc..."
Citing the word whah meant to spill, or pour, in Native languages west of the Cascades, she found it likely that Whalla-mut referred to either the falls at Oregon City, or the place where the river flowed into the Columbia, or the region between both points. "After careful consideration, I adopted the "Wallamet" spelling as retaining the sound of the original word, and at the same time deferring to an English notion of orthography, since all our Indian words are more or less anglicized." "The Indians have more poetic talent than we are aware of, and this word is used by them as an adjective to describe the river, not as a noun merely to name it." E.W.Reynolds sides with his Democratic friend, Judge William Strong. -The Oregonian, November 12 1874. The controversy drew letters and readers to Portland newspapers. 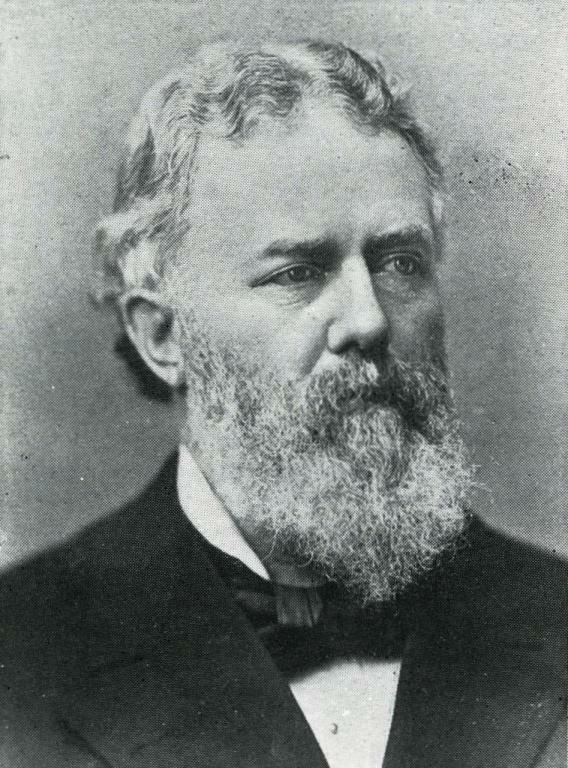 More than just a scholarly parlor game among the learned, it reflected social and political divisions, such as when James O'Meara, editor of Ben Holladay's paper, the Daily Bulletin, needed distance from Judge Deady for political reasons and opted to change his stance on Will / Wall to allow a sundering that concealed his true motives. Readers lined up behind Judge Strong or Judge Deady. The exchange became heated. 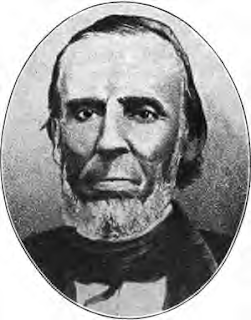 Strong lampooned Deady as "the only gentleman who hailed from Portland-on-Wallamet." Deady fired back at Strong's "silly little legend of the three French Willies." Strong had "committed gross and unpardonable error." Deady was "so very particular to criticize small mistakes, even those which can have no real bearing upon the real merits of the question." Strong had "fallen into pleasant delusion" and "relied upon his imagination for facts." Deady had a "mania" on the issue (Strong might have had him there). "Judge Strong is a volunteer in this controversy, and it is his duty to inform himself before he undertakes to teach others." -The Oregonian, from Judge Deady's Reply to Judge Strong's Second Letter, November 20 1874. To vitriol was added virtuosity as each side piled precedent upon precedent to make their case. Explorers accounts, linguistic tracts, pioneer reminiscences, maps, old deeds, receipts and legal transcripts were produced and duly cataloged as arguments continued into 1875. "But since Wil-lamette has become the more frequent form, in usage, would it not be well to accept the change? That is a question on which people may differ. Those who think it is desirable to preserve the original names of places and prominent physical objects in the country will take the negative; those who do not think so will take the affirmative." The controversy generated so much interest that thirteen of the most noted letters from 1874-75, along with five from the initial skirmish of 1870, were gathered by George Himes in Wallamet or Willamette, a sixty six page book published in May 1875. 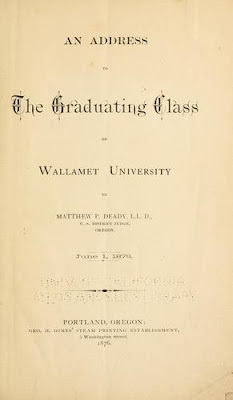 On June 1st 1876, six years after Willamette University changed from Wallamet University, the school reverted to its original name for a day when Judge Matthew Deady addressed its graduating class. The final volley in the exchange took place nearly a quarter century later. On November 25 1895, two years after Deady's death and eight after Strong's, the Oregonian published Wallamet, A Post Script to an Old Controversy by Richard Hopwood Thornton, which drew attention to Captain Nathaniel Portlock's Voyage Around the World (1789) as the earliest source of the word in print. Portlock described seeing daggers purchased by the Indians of Puget Sound at "Wallamute." The book, a copy of which was in the Portland Library, had miraculously escaped detection during the controversy (today it resides in the John Wilson Special Collections room at the Multnomah County library). The revelation did not revive the debate, which was itself was receding into history. 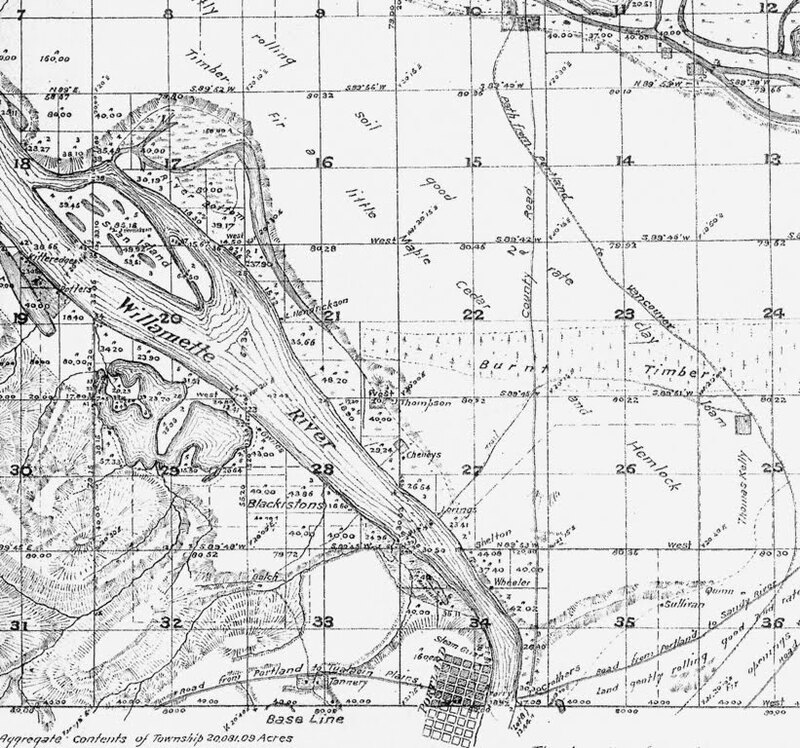 Wallamet was becoming a quaint anachronism, while Willamette, certainly by the publication of Lewis A. McArthur's Oregon Geographic Names in 1928, had achieved the status (apologies to Judge Deady) of stare decisis. This post is dedicated to John Terry, member of the Oregon Geographic Names board and author of the Oregon Trails column in the Oregonian, which was sadly discontinued last Sunday. The column has been a favorite of mine for years. It did much to develop my belief that history is not something that just happens somewhere else. Thanks John! -Dan Haneckow, Portland-on-Wallamet, December 29 2011. (...the surname is of eastern German origin. The c was mysteriously added in America, decades after its arrival. The name ends with a long o sound, along the lines of Paltrow).